White Biocentrism • View topic - Are Southerners the reason American WN is failing? Whites must be organized by courageous and disciplined men. Organization and discipline matter more than almost anything, but as these are not Southern virtues, they are downplayed by Southern-legacy white nationalism, which tries to turn everything into a fistfight. What in hell is Linder talking about? I don't see any courage coming out of his undisciplined, anonymous VNNers, mch less any viable organization. VNN is known for the fighting among posters there, which is encouraged by Linder by his policies. We won't be tolerating that sort of behavior here at WB. The same spirit that lost the South the war is alive today. Side point is we need moral courage even more than physical courage, yet it's rarer. Sounds like something I've been saying for years. Except I mean it. Originally published as a series in his newspaper and magazine, this book is the final work of one of the most famous leaders of the White nationalist movement in America. 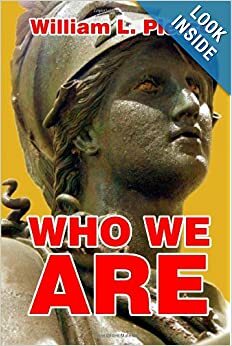 Starting with the evolutionary origin of the White race, this book focuses on the the Classical Grecian and Roman civilizations, the White nations of the Middle East, the rise of the Germanic powers, the Vikings, Christianity, Nazi Germany, World War II and the racial crisis facing the West today. It contains, characteristically for the author, a highly critical appraisal of Jewish influence in Europe, and ends with a proposal of how the essence of the west can be saved. The book contains the entire text and almost all the illustrations which accompanied the original. It has also been fully indexed. Dr. Pierce had a plan for organizing our race; Mr. Linder does not (other than beating up on good men like Pat Buchanan and Dr. Kevin MacDonald, et. al.). View Poll Results: In what religion do you believe? This current sampling shows nearly 1/3 of VNNers are Christian, and that doesn't include Identity Christians. About the same number claim to be atheists; 10% Odinists, with a couple of Hindus and a Buddhist thrown in for good measure. There are no Cosmotheists, the religion Dr. Pierce founded for Whites exclusively, nor any followers of Creativity, the Whites-only religion founded by Ben Klassen. Both of those men, by the way, headquartered their operations in Southern Appalachia: the South. How does the reader suppose Linder will organize this hodgepodge into a disciplined, courageous group of fighters for the race? We will not have his problem of crass inconsistency here at White Biocentrism because our goal is to attract White men and women who reject the Abrahamic religions and embrace the teachings of men like Dr. Pierce and Ben Klassen -- especially Southern men and women. Another thing: although I can't search Mr. Linder's forum to find it, I recall seeing another poll of VNNers asking them where they live. A majority or near majority were from the South, oddly enough -- the very people Linder criticizes as dumb losers who have no moral courage. Re: Are Southerners the reason American WN is failing? It's been my experience that American WN is failing because of the dumb losers and inbred misfits (from all over the place) that are allowed to take root and nest within WN organizations. Organizations by and large tend to go for "quantity" over "quality," and the ones that do seem to go for "quality" don't really have a process in place to deal with bad seeds that slip in until they've done a lot of damage to morale. I am neither excessively pro or anti when it comes to Alex Linder. That is because, at times, he says something better than anyone else - albeit rarely. As to his remarks regarding "Southerners" or "Southrons" (my birth state fought for the CSA) I view it this way: I do not believe geographical location should be emphasized in the WN Cause, any more than what one's religion is, or whether one normally votes Republican or Democrat, or even one's stance regarding non-racial issues, such as homosexuality. All those elements, in my opinion, dilute both our case and our cause in the public eye. As a sidenote, Missouri is a borderline Southern state anyway, and was even a slave-holding state during the Civil War. So Linder's protest is stretching it a bit. Could a modus vivendi be reached with individuals like Linder? If done right, I believe so. But...no one attempts it, not in any serious manner. Now, not being an NA member, some may think me presumptuous when I make this suggestion: that the NA, once it is on its feet, provide a decent used vehicle backed by moderate funding so that an "emissary" or "ambassador", armed with a laptop, could work his way across the nation, hitting the doorsteps of people like Linder and others, in order to come to some sort of solid consensus regarding the Cause. This emissary would be intelligent, well-spoken, photogenic, possibly a man/woman pair, essentially performing the WN equivalent of emissaries from a country's government. This is something I'm not sure has been done and for those who believe it would be a waste of time, perhaps so. But if it IS a waste of time, meaning rational, reasonable encounters between pro-white advocates must invariably end in scorn and enmity, rather than solid cooperation, then how do we expect to win the War at all? RebelWithACause wrote: It's been my experience that American WN is failing because of the dumb losers and inbred misfits (from all over the place) that are allowed to take root and nest within WN organizations. Organizations by and large tend to go for "quantity" over "quality," and the ones that do seem to go for "quality" don't really have a process in place to deal with bad seeds that slip in until they've done a lot of damage to morale. Indeed, as "WN" is just a nominal "place-holder" for being "pro-White" and for little else. our NA and WB and NV and leadership strata and allowing any such damage to our morale. correct for them this time. Personal Godhood via The Path and of which is also OUR CAUSE. Well you know as an individual from western NC and of older values I don't think southerners in general make poor WN's.However there's the common kind of southerner that does more harm than good.They're Baptist as a commonly practiced religion.They or their kids drive around in a pick-up truck with a confederate flag.They would make it a point to commit a hate crime yet you can't get it through to them that approach creates no effective results.Wearing skin tight jeans and cowboy boots as the term Redneck people so commonly use.Generally short tempered and use of courtesy of manners varies drastically.You ask them in an depth question of why they hate Jews they say 'because they killed Jesus' or a way off base uneducated answer that's not part of the real problem.They don't strike you as a country boy or farmer you see them as an ignorant individual with a chip on their shoulder always.These individuals I consider to be the 'KKK Fare'.Though the KKK has many members but they attract a criminal more than a deep-thinker.The KKK is concerned as a White Nationalist group but the key to radicalizing is factual education.What I feel the Klan teaches is 'clueless motives behind White Nationalism'.Depends on the individual but they meet a Russian they think commy.They meet a German they think Nazi and hate.Appreciation for our European ancestry is not present primarily from these individuals.Someone should remind this narrow-mindedness that our Irish and Scottish ancestors were behind good ol' bluegrass...a strong part of our southern culture and downright uplifting .And as the oldest organization they started out committing hate crimes without sitting back and observing.People see that 'KKK aftertaste' and people get the wrong impression of other groups like the National Alliance.But that is why I feel membership in the Alliance would be an effective choice on my end.Intellectual people to interact with whom I feel will create the impact and open more eyes to concerned individuals with rational motives. I'm painfully aware of the type of Southerner you describe, TIW. But I've also met Southerners who are some of our best and brightest racial stock, and who reject that bigoted stereotype. We've got good and bad folks wherever Whites live; it's the former who will be attracted to our Alliance. The latter are not interested in our message for the most part, which is good. The term White Nationalist is so all-encompassing that it includes many who we really do not want in the National Alliance. I dug up a couple of Commentaries by Dr. Pierce in 2002 and had a volunteer transcribe and combine them. Find that transcription here: http://williamlutherpierce.blogspot.com ... iance.html Lots of other pre-Internet articles by Dr. Pierce are at that blog. Dr. Pierce said, "They cling to the trivial and deny the important." Dr. Pierce certainly had a way of digging right in to where the truth is, and those words are no exception. I was for several years a member of the League of the South, and also a member of the secessionist (and now mostly defunct) Southern Party, although the Southern Party was never really more than a political action committee in North Carolina, it got registered as a party in Georgia, and has run candidates on occasion there, but it is apparent by now that it is not going anywhere. Members of these groups are generally more mature and realistic than the play-acting re-enactor bunch, but few if any have the moral courage to openly address the race issue. Furthermore, any mildly critical remark about Jews is sure to make the room grow colder than an arctic ice cave. These are the reasons why I am no longer a member of either organization. I posted on VNN forum a few times about a year-and-a-half ago, and I was immediately greeted with attack posts by several of their members. It seems they already knew who I was from other forums. They already knew that I am no Linder fan. I only post on two forums now and keep my identity secret on one of them. The NA will be great now that it is in the right hands. Will Williams and Kevin Alfred Strom are the only two prominent WNers that I would want to work with, because they are the only two that I both like and think they have the right ideas. Are Southerners More Likely To Be Christians? For thousands of years, Jew-worship and lies have been destroying the White race/civilization, and the pride that it needs in order to survive and to propagate itself. "And he shall deliver their kings into thine hand, and thou shalt destroy their name from under heaven: there shall no man be able to stand before thee, until thou have destroyed them." "And He shall deliver their melachim into thine hand, and thou shalt destroy their shem from under Shomayim; there shall no man be able to stand before thee, until thou have destroyed them." Where I am at in Iowa it is painfully aware that our race is failing itself. It seems that for White girls, having a niglet or three is the latest fashion that's been pumped into them by a thoroughly jewed mass communications structure. So it cannot be a Southern problem. No, I think it is an "us" problem, meaning all Whites are responsible for this. We had not taken the time to think out why we should live, what are we all about, how do we get to there from here and inculcate this into each and every one of us. Fortunately, Dr. Pierce and the National Alliance have done a marvelous job of providing answers to these questions through the National Vanguard Books publishing arm as well as outreach efforts made by each and every member who has lifted a finger for our cause.